Did you receive your copy of the January Newsletter? 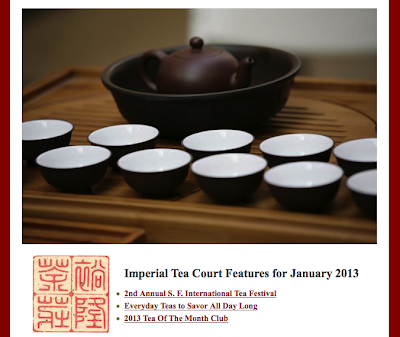 I spent part of the holidays researching the Camellia Sinensis archives and found this wonderful tool for tea lovers. Virginia Hines originally posted it in February, 2009. In case you missed it, I thought it was well worth repeating. My sample screenshot was from a search for "Da Hong Pao". The results were a short but interesting explanation plus a list of additional articles in their database. Such fun! Confused by the myriad possibilities for romanizing the names of Chinese teas—not to mention the different names Chinese use for the same or similar teas? There's a website for that! Check out Babelcarp. As the FAQ warns, Babelcarp is Camellia sinensis-centric. For example, it doesn't index Indian teas or other Chinese herbs that may be infused. However, for beginning to sort out cross-cultural complexities associated with the names of Chinese teas it's a great start that we're eager to share.